Videos are one form of owned media. There is good news and bad news when it comes to academics disseminating research. On the negative side, traditional media relations is tougher than ever. The media industry is going through constant disruption. Print advertising continues to decrease, according to the latest State of the News Media 2013 Report. Many city newspapers that had been around for over 100 years are no longer in existence (see the Rocky Mountain News for example). Newsroom staffs continue to shrink, while demands and pressures mount on journalists. Thus, more time, effort and strategy needs to go into “earned media” – pitching stories and articles to journalists through traditional media relations. The good news is that academics have the ability to be their own broadcasters by deploying an “owned media” strategy. Thanks mainly to social media, professors who are dedicated to the cause can directly attract their own audiences. Case in point is Dan Ariely, a professor at Duke University’s Fuqua School of Business. His blog is updated several times per week. He reaches audiences on the go through his podcast Arming the Donkeys. He disseminates content through his Twitter account, which has over 53,000 followers. Over 4,000 people subscribe to the Dan Ariely YouTube channel. Dan has essentially set up his mini media empire. He literally has more Twitter followers than many local newspapers! Obviously not everyone is going to have the same degree of impact as Dan. He puts the constant effort into both owned and earned media, and having a couple of best-selling books certainly doesn’t hurt either. Dan actually generates a majority of his coverage through his own efforts. I bring up Dan to exemplify the potential professors have to use both owned and earned media tactics to disseminate their ideas, research and analysis. Next time you have an interesting story to share, think about it going down both the owned and earned media tracks. So in terms of earned media, you could think about writing an Op Ed, issuing a press release to a few targeted journalists, linking your analysis to a newsworthy topic and meeting informally with journalists during your travels to build relationships. On the owned media side, you can think of both your own channels and the university’s outlets as dissemination channels. At the Fuqua School of Business, we think through a comprehensive owned and earned media strategy when promoting our faculty’s research. 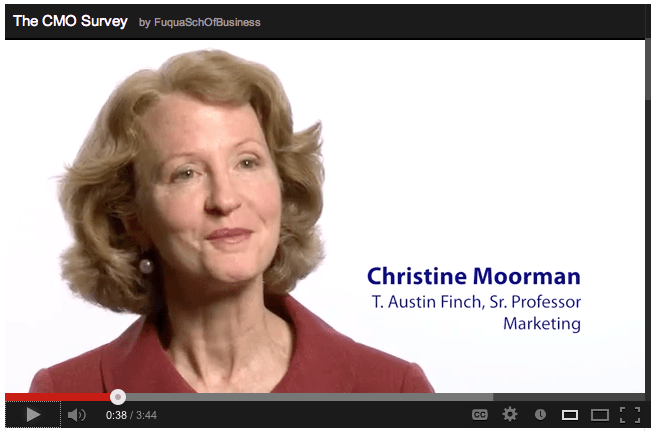 For example, Professor Christine Moorman conducts a survey of chief marketing officers two times per year. We disseminate these findings through earned media: a press release and an opinion piece which Christine writes for Forbes. If something is a hot topic in the media, we will work on a Duke News Tip. We make sure to do blogger relations with the goal that prominent marketers in the social space are aware of the survey and will potentially tweet and/or blog about it. In addition, we promote these findings through the Fuqua’s owned media channels (Twitter and Facebook). We will also work with the university so the research findings are disseminated through Duke University’s social channels. We record a separate video on YouTube and feature the findings on our web site and in our thought leadership newsletter, which is disseminated to over 200,000 individuals. On top of that, Professor Moorman disseminates the content through her owned media channels (she has over 1,000 followers on Twitter) and her CMO Survey web site. All of these efforts combined lead to significant visibility. Mastering these areas is no simple task. I covered the topic of translating academic research for practitioner outlets in my previous blog post. For earned media, you should get trained using social media channels. Hopefully your university has the resources in place to provide this type of training. You then need to realize the time commitment that is needed to make an impact over the long-term. Sending out one tweet every six months when you have a new research study published won’t cut it. You need an individual strategy, as well as the mindset to commit to this activity regularly over the long haul. Perspective is important. Don’t think about getting famous overnight. Sure, we all want to get our thoughts out in the public and have some degree of visibility, but if you make this your sole aim, you will probably fail. Combine this objective with the goals of learning and networking and you will increase your chances of a more enjoyable and beneficial experience.